Listen to the podcast. Find it on iTunes/iPod and Podcast.com. Download a transcript. Charter Sponsor: Active Endpoints. Also sponsored by TIBCO Software. 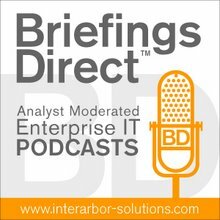 Welcome to the latest BriefingsDirect Analyst Insights Edition, Volume 45. This periodic discussion and dissection of IT infrastructure related news and events with industry analysts and guests, looks at a new book on cloud computing, a step-by-step guide on figuring out the right path to combined cloud and SOA benefits. Dave Linthicum's new book, Cloud Computing and SOA Convergence in Your Enterprise: A Step-by-Step Guide, has just arrived and digs into the conflation of SOA and cloud computing. Our discussion with Linthicum on his findings is moderated by me, Dana Gardner, principal analyst at Interarbor Solutions. Linthicum: SOA is the way to do cloud. I saw early on that SOA, if you get beyond the hype that's been around for the last two years, is really an architectural pattern that predates the SOA buzzword, or the SOA TLA. It's really about breaking down your architecture into a primitive state of several components, including services and data and processes., Then, it's figuring out how to assemble those in such a way that you can not only solve your existing problems, but use those components to resolve problems, as your business changes over time or your mission changes or expands. Cloud computing is a nice enhancement to that. Cloud doesn't replace SOA, as some people say. Cloud computing is basically architectural options or ways in which you can host your services, in this case, in the cloud. As we go through reinventing your architecture around the concept of SOA, we can figure out which components, services, processes, or data are good candidates for cloud computing, and we can look at the performance, security and governance aspects of it. We find that some of our services can exist out on the platform in the cloud, which provides us with some additional architectural advantages such as self-provisioning, the ability to get on the cloud very quickly in a very short time without buying hardware and software or expanding our data centers, and the ability to rapidly expand as we need to expand basically on demand. If we need to go from 10 users to 1,000 users, we can do so in a matter of weeks, not having to buy data-center space, waves and waves of servers, software, hardware licenses, and all those sorts of things. Cloud computing provides you with some flexibility, but it doesn't get away from the core needs to architecture. So, really the book is about how to use SOA in the context of cloud computing, and that's the message I'm really trying to get across. ... As we move toward cloud computing, there are more economical and cost-effective architectural options. There is also the ability to play around with SOA in the cloud, which I think is driving a lot of the SOA. In fact, I find that a lot of people build their first initial SOA as cloud-delivered systems, be it Amazon, IBM, Azure from Microsoft, and some of the other platforms that are out there. Then, once they figure out the benefits of that, they start putting pieces of it on premise, as it makes sense, and put pieces of it on the cloud. It has the tendency to drive prototyping on the cheap and to leverage architecture and play around with different technologies without the investment we had to do in the past. ... We've got to stop the insanity. We've got control IT spending. We've got to be much more effective and efficient with the way in which we spend and leverage IT resources. Cloud computing is only a mechanism, it's not a savior for doing that. We need to start marching in new directions and being aggressively innovative around the efficiency, the expandability, and ultimately the agility of IT. ... When you're doing SOA and considering SOA within your enterprise or agency, you should always consider cloud as an architectural option. In other words, we have servers we're looking to deploy in middleware, we're looking to leverage in databases we're looking to leverage in terms of SOA. It's governance systems, security systems, and identity management. Cloud computing is really another set of things that you need to consider in the context of SOA, and you need to start playing around with the stuff now, because it's so cheap. There's no reason that anybody who's working on an SOA shouldn't be playing around with cloud, given the amount of investment that's needed. It's almost nothing, especially with some of the initial forays, some of the prototypes, and some of the pilot projects that need to be done around cloud. ... Software as a service (SaaS) is probably the easiest way to get into the cloud. It also has the most potential to save you the greatest amount of money. Instead of buying a million-dollar, or a two-million-dollar customer reliationship management (CRM) system, you can leverage Salesforce.com for $50-60 a month. After that, I would progress into infrastructures as a service (IaaS), and that's basically data center on demand. So, it's databases, application servers, WebSphere, and all those sorts of things that you are able to leverage from the data center, but, instead of a data center, you leverage it from the cloud. Guys like Amazon obviously are in that game. Microsoft, or the Azure platform, are in that game. Any number of players out there are going to be able to provide you with core infrastructure or primitive infrastructure. In other words, it's just available to you over the 'Net with some of kind of a metering system. I would start playing around with that technology after you get through with SaaS.
. . . Instead of having to buy infrastructure and buy a server and set it up and use it, we could go get Google App Engine accounts or Azure accounts. Then, I would take a look at the platform-as-a-service (PaaS) technology, if you are doing any kind of application development. That's very cool stuff. Those are guys like Force, Google App Engine, and Bungee Labs. They provide you with a complete application development and deployment platform as a service. Then, I would progress into the more detailed stuff -- database, storage, and some of the other more sophisticated services on top of the primitive services that we just mentioned. ... PaaS with that Google App Engine is driving a lot of innovation right now. People are building applications out there, because they don't have to bother existing IT to get servers and databases brought online, and that will spur innovation. So, today, we could figure out we want to go off and build this great application and do this great thing to automate a business and, instead of having to buy infrastructure and buy a server and set it up and use it, we could go get Google App Engine accounts or Azure accounts. Then, we can start building, deploying, defining the database, do the testing, get it up and running, and have it immediately. It's web based and accessible to millions of users who are able to leverage the application in a scalable way. It's an amazing kind of infrastructure when you think about it. The potential is there to build huge, innovative things with very few resources. ... Ten years ago, it was very difficult to do a start up. You'd have a million dollars in investment funds just to get your infrastructure up and running. Now, startups can basically operate with a minimal amount of resources, typically a laptop, pointing at any number of cloud resources. They can build their applications out there. They can build their intellectual capital. They can build their software. They can deploy it. They can test it. Then, they can provision the customers out there and meter their customers. So, it's a great time to be in this business. ... There needs to be a lot of education about the opportunities and the advantages of using cloud computing, as well as what the limitations are and what things we have to watch out for. Not all applications and all pieces of data are going to be right for the cloud. However, we need to educate people in terms of what the opportunities are. The fact of the matter is that it's not going to be a dysfunctional and risky thing to move pieces of our architecture out into cloud computing. Get them around the pilot. Get them to go out there and try it. Get them to basically experiment with the technology. Figure out what the capabilities are, and that will ultimately change the culture. ... We're going to get to a point where the data is going to be a ubiquitous thing. It doesn't really matter where it resides and where we can access it, as long as we access it from a particular model. It's not going to make any difference to the users either. I just blogged about that in InfoWorld. In fact, we're getting into this notion of what I call the "invisible cloud." In other words, we're not doing application as a service or SaaS, where people get new interfaces that are web-driven. We're putting pieces of the back-end architectural components -- processes, services, and, in this case, data -- out on the platform of the cloud. It really doesn't matter to them where that data resides, as long as they can get at it when they need it.